Want to learn more about the camping must haves that you saw today on Twin Cities Live? 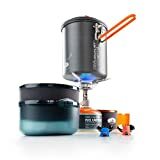 I’ve put together a list of all the camping gear that was featured today on the show along with why I like that product, any cons that I have found, tips on how to use the gear and finally, where you can purchase the item. If you have any other questions, I’m always happy to help. Just leave a comment here or leave me a message on our Facebook Page. Also, make sure to check out free family camping guide right here. The Coleman WeatherMaster is literally the perfect family camping tent. First and most importantly, it won’t cost you a fortune. This tent is high quality, but doesn’t cost anywhere near what many super high quality and light weight tents will. The WeatherMaster is also quick to set up. It typically takes me between 10-20 minutes to have the tent up and stable. Finally, this tent is big. I’ve got 5 kids (with twins on the way!) and while our teenagers don’t join us family camping too often anymore, we easily sleep five people in this tent with no issues and nobody is complaining of a lack of space. When you add in the screened porch, which is perfect for storing shoes, coolers, a couple of chairs and extra gear, you have all the space needed for a fun family weekend. The WeatherMaster is not light. Weighing in at 36 pounds, this is not a tent that you want to carry a long distance to your campsite. It is ideal for campsites that are accessable by car. It is also very big, which I did list as one of the things I liked. But if you are trying to conserve space or have a small campground, it may not be the best choice. I always recommend buying a tarp to place under your tent. This serves multiple purposes. First, it will protect the bottom of your tent from wear and tear. Second, it can help keep rain and moisture from seeping in through the bottom of your tent. For more, read our Complete Guide To Buying A Tent. The Coleman Xtreme is a high performing cooler disguised with a cheap cooler price tag! 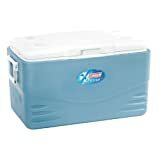 The Xtreme Cooler line will keep ice for 5+ days and the different sizes of this cooler typically runs between $30-$100. While these coolers may not be as durable as a Yeti Cooler, I’ve had mine for 5 years and it is holding up perfectly. I don’t really see any cons with the Coleman Xtreme. I think if it had a more heavy duty build like the Yeti, it would be massivly overweight, just like the Yeti. For this reason, I am fine with the current build of the Coleman Xtreme. A simple trick to make your cooler stay cold longer is to cool the cooler the night before you pack it with ice and food. I do this by throwing a batch of ice from the freezer in it the night before. This takes the warm cooler and gets it pre-chilled. Another great tip is to freeze milk jugs full of water. These last a lot longer than bags of ice. I actually put the Coleman Xtreme to the test against an expensive Yeti Cooler! Read how the Coleman Xtreme did right here! The GSI Microdualist has everything that I NEED for camp cooking. It has a stove, pot, wind blocker, two bowls, two cups, and two sporks. The best part is that it all fits into one small container (the pot) and weighs less than 1.5 pounds. The only other con is that it isn’t exactly perfect for family camping. The most I’ve used these cooksets for is groups of 4 and even then it was best to have two sets. The Microdualist is perfect for backpacking, Canoeing and Hammock camping, but if you plan on car camping or family camping, then I would recommend going with something a little bigger and cheaper. Want to see how we used our GSI cooksets in Minnesota’s Boundary Waters Canoe Area? Read all about using the GSI cooksets right here. Also, make sure to check out our entire trip to the BWCA here! Made of highly conductive, lightweight aluminum with a hard anodized finish. Lightweight, high-efficiency, 9,629 BTU/h2 Pinnacle Canister Stove and Windscreen nest perfectly and provide ultimate efficiency regardless of conditions. Often times when I’m out camping with my family in the spring or fall, night time can get cold, I mean really cold! Obviously we all have the appropriate sleeping bags to stay warm, but it can also be nice to have a toasty warm tent to crawl into as well. This is why I like to bring along my Mr. Heater and get the tent nice and toasty before climbing in at night. The Mr. Heater is great because of the safety functionality it has. The heater will automatically shut down if it tips over or if the oxygen sensor senses low oxygen. The heater also runs on 16 oz propane canisters, the same ones my grills run on, making it perfect for camping. While not a con against the heater exactly, I am never fully comfortable running a heater in a small tent area. Fear of a fire or carbon monoxide poisoning is still a real concern for me. 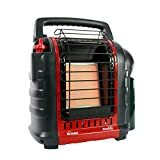 I personally make sure to only run the heater when I am in the tent next to it, clear out the space in front of it and only run it for 30-60 minutes. Then I shut it down, make sure it’s cool and set it just outside the tent for the night. Never leaver the heater unattended and make sure it has a clean line of sight in front of it to prevent any possibility of a fire. 4,000- to 9,000-BTU radiant heater for spaces up to 225 square feet. Approved for indoor/outdoor use; clean-burning, nearly 100% efficient. Auto shut-off if tipped over, if pilot light goes out, or if detects low oxygen levels. Honestly, this tent is just plain fun. 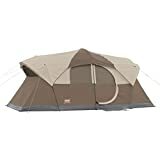 My wife loves it because it feels fancier than many of the more traditional tents that you see by Coleman and others. I’ve seen many reviews online complaining about the quality of this tent, but this is a perfect example of “you get what you pay for”. This tent is roughly $100, which is insanely cheap for any kind of tent, especially these yurt types. If you check on Amazon, you’ll see that high quality canvas yurts are anywhere from $500 – $1,000 (seriously, take a look here!). As with any tent, i always recommend placing a tarp under the tent when you set it up. This gives you an extra barrier of protection against ripping the bottom of your tent and against moisture leaking into your tent. Also, make sure you have plenty of room around the tent as you’ll need to stretch the tie downs out and stake them to the ground to hold up the tent. Want to know more about about buying the perfect tent for your family? Check out our Complete Guide To Buying A Tent. I like the Texsport Over Fire Grill because it is simple, durable and folds flat making it easy to transport. And who doesn’t like cooking directly over the fire when out camping? 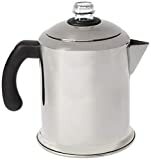 We use ours for burgers, getting the coffee pot warm, placing the dutch oven on and more. While being a bit heavy (it is made of steel! ), there are no real cons for this item, it is exactly what you think it is. Keep the fire under this grill small and the flames low. The best way to use it is to place the grill with a small fire (no more than 2 or 3 logs) and let the fire burn down to a low flame fire with lots of red hot coals. The Kamp-Rite Tent Cot is perfect to bring along on a family camping adventure if you have any older kids who may not be interested in sleeping in a large tent with the entire family. This tent cot is fun, sets up quickly and gives the person their own personal space. It can also be used as a folding chair during the day. The cot tent is heavy and big to pack. If you have a lot of space and weight isn’t an issue, then it is great. But if you are already low on space and if you have to carry your gear into your campsite, you may want to pass. This cot tent is really comfortable, but I still like to use an inflatable sleeping pad under my sleeping bag. The pad mixed with the cot makes for a great nite of sleep. Also, make sure to put on the rainfly before bed!! 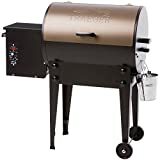 Light weight aluminum frame supports up to 300 pounds- folds down to 33"x30"x6"
I just got a Traeger Tailgater this summer and wow do I love this grill! I can only describe it as the perfect mix between a smoker, a grill and an oven. Traeger Grills are wood pellet grills that have precise temperature controls to perfectly smoke and grill your food. I’m currently working on a complete review of the Traeger that will be posted here within a couple of days. While the Tailgater is one of Traeger’s more mobile grills, it is still big, takes up a lot of room and requires an electric plugin. If you have the room and you have electricity on your campsite though, the Traeger will turn your camp cooking into a fun experience and the taste cannot be beat. I haven’t had a lot of time with my Traeger yet, so if you are looking for more info about Traeger grills, check out their website here. Hot and fast, or low and slow, the Traeger Tailgater pellet grill offers 6-in-1 versatility to grill, smoke, bake, roast, braise, and bbq food to juicy perfection. While I’m not a fan of bringing phones out on your camping trips, lets face it, your phone can be pretty handy. If you have an emergency, need a GPS, or even just for taking photos, they can be great to have. The SunJack Solar Charger is perfect for keeping those phones fresh and ready to go. It is also great for recharging your lantern, an iPad or laptop. If you need a solar charger, it probably means that you are bringing civilization with you. I am as guilty as the next person, so I get it! I’ve brought my sunjack on many different trips. From backpack camping to canoe camping. What works best for me is to hang the solar charger off the back of my backpack while hiking or hanging it on the side of my tent while at the campsite. Read my full review on the Sunjack Solar Charger here. Solar panels pump out up to 2.8 Amps of USB power. A smart chip allows the battery to detect your device and the fastest charging speed. Dutch ovens are great. I use them in my house and when I’m camping. The amount of things you can make in a dutch oven is simply amazing. Lodge is also one of the most trusted brands in cast iron cookware. When you buy a cast iron piece from them, you can count on it lasting your lifetime! Cast iron is heavy! If you have to hike in to your campsite, you’re better off packing lightweight. To find out how to season, cleand, and care for Dutch Ovens (and get 35 Amazing Campfire Dutch Oven Recipes!) read our Complete Guide on Dutch Ovens here. The Lodge portable “camp stove” is the pot that does it all. The flanged lid holds hot coals and inverts for use as a griddle. The integral legs allow the oven to sit perfectly over the campfire. Like I said earlier in this post, cooking over a campfire is plain old fun! I like to use my tripod for holding my dutch over the fire at the perfect height to get the perfect temperature. If you want to make sure your tripod doesn’t tip over, shove the legs down just slightly into the ground before placing your dutch oven on. It is also a good idea to set it up over a smaller fire before you light the fire! Read our huge post on The Ten Best Methods To Make Campfire Coffee. Honestly, I’m not going to recommend any specific sleeping bags here because there are so many different variations for different people and different camping trips. Big bags, small bags, 50 degree, 40, 30, 0 and even -30. Instread, check out our How To Buy The Best Sleeping Bag For You right here. If you are looking for more great camping info, check out our Start Here page for some of our best content all in one place. The Mr. Heater Buddy is awesome. We use it in our tent just like you do. It’s really great for the mornings when we wake up and everything is cold. It makes it so much easier to get my kids up and dressed. We don’t run it while we sleep but I do bring a battery-powered carbon monoxide sensor to keep in the tent as an extra layer of protection.